We are the south wales Agent for Lugarde. 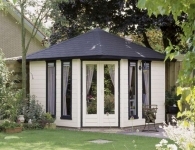 Lugarde designs and creates garden houses, log cabins, verandas, garages and holiday homes in a wide variety of models and sizes, offering lots of space for our customers to meet their own specific demands. Because Lugarde is responsible for all aspects of production, the dimensions we offer are very flexible and we are able take into account your personal requirements. We have ample scope to "play around" with various aspects of the design, such as dimensions, layout, type of windows and doors, insulation, multiple levels, veranda, window shutters, canopy and coupling with other garden houses or log cabins. These options allow you to create a garden house or log cabin that fits in with your home and environment. Lugarde is continuously innovating, which has resulted for example in the highly recommended Prima 3=1 system.